The holidays are a busy time, and that's why it's wonderful to get moments of relaxation and peace with your kids. A great way to celebrate the season, and each other, is by making fun and creative treats. Whether on a lazy weekend morning or snow day, you and your kids will love cozying up to these festive eats. They're a perfect part of a day of relaxation, so indulge your sweet tooth and put some smiles on your children's faces with the tasty waffle treats below. And with the Oster® Titanium Infused DuraCeramic™ Flip Waffle Maker with all natural, non-stick ceramic coating, you can make sure the focus is on the fun, and not on the clean-up. Pumpkin pie is a staple holiday dessert, but it takes on a new layer of fun in waffle form. 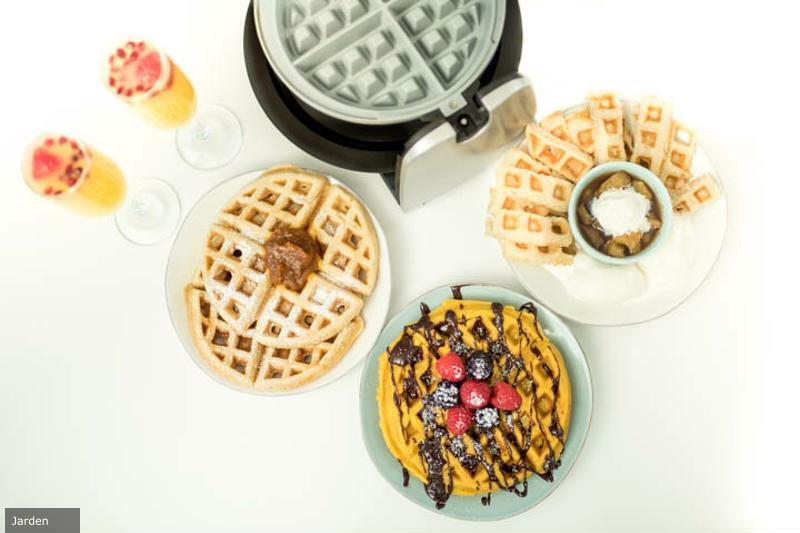 Pumpkin puree flavors up basic waffle batter, while a decadent cinnamon-chocolate topping is the stuff holiday dreams are made of. In a large bowl, mix together flour, baking powder, baking soda, 1/4 cup brown sugar, white sugar, 1 teaspoon cinnamon, nutmeg and salt. In a separate bowl, mix together the pumpkin puree, eggs, milk and melted butter. Add wet ingredients to dry, then stir to combine fully. Pour a portion of batter into Oster® Titanium Infused DuraCeramic™ Flip Waffle Maker. Close waffle maker and rotate 180 degrees to the right; cook for 3-5 minutes. Repeat with remaining batter. To make the topping, melt chocolate chips in microwave, then stir in heavy cream, 2 tablespoons brown sugar and 2 teaspoons cinnamon. Pour over cooked waffles and enjoy. Apple pie gets a makeover in this fun and creative recipe. Cinnamon-flavored waffles are sliced into small bars, which are then dipped into a rich, warm apple compote. In a large bowl, combine flour, baking powder, baking soda, 1/2 cup white sugar, 2 teaspoons cinnamon, nutmeg and salt. In a separate bowl, mix together eggs, milk and butter. Add wet ingredients to dry, then stir to combine fully. To make the compote, heat 1 cup white sugar and 1/4 cup brown sugar in a saucepan over medium heat, stirring consistently as sugars begin to melt. Add 1 teaspoon cinnamon and diced apples. Stir consistently as apples begin to soften; once tender, remove from pan. Pour portion of waffle batter into Oster® Titanium Infused DuraCeramic™ Flip Waffle Maker. Close waffle maker and rotate 180 degrees to the right; cook for 3-5 minutes. Repeat with remaining batter. Slice each waffle into evenly sized bars, and serve with a small bowl of the compote for dipping. Get festive with your waffles this holiday season! Maple syrup is drizzled on your basic waffle, but this festive recipe adds maple flavor right in the batter. And while caramel and maple are great flavors on their own, they're even better together with these fun maple butter-topped waffles that celebrate the season. In a large bowl, combine flour, baking powder, baking soda, brown sugar, cinnamon and salt. In a separate bowl, mix together eggs, milk and melted butter. Add wet ingredients to dry, then stir to combine. Fold in maple syrup and stir until fully incorporated. Pour portion of batter into Oster® Titanium Infused DuraCeramic™ Flip Waffle Maker. Close waffle maker and rotate 180 degrees to the right; cook for 3-5 minutes. Repeat with remaining batter. Top cooked waffles with maple butter and powdered sugar and enjoy.